We’ve all heard of Rosa Parks and her extraordinary feat. She stood up to racism and segregation by refusing to move to the back of the bus. What made her do it? Well she was tired, fed up and one day decided not to move when the bus driver told her. It’s the story that we’ve all heard but it’s not the whole story. Truth, Rosa Parks had been working all day. Truth, she was probably very tired. Also true, she was fed up with the inequitable system of segregation like most Blacks who lived during this time. Yes, she stayed put when a driver told her to move. Why should she move when her seat was already in the Blacks only section? Also true, the driver moved the sign to accommodate the quickly filling bus so that Whites could have a seat. Rosa Parks was arrested, started the boycott and the rest is HIS-tory. Blacks were free to ride the bus, segregation ended and everyone lived happily ever after. In a perfect world, an utter fairytale, in HIS-story this might be the case. Thankfully the entire story, the truth is filled with substance and includes many heroines that came long before our Beloved Rosa Parks. This is not to say that Rosa shouldn’t be celebrated and is unworthy of the many accolades and fame that has followed her brave act. She deserves it. Every bit of it…yet so does Wells, Graham, Morgan, Smith, Browder, Colvin, McDonald, Robinson and their respective communities. Fortunately, this was not the mind set of those hundreds of thousands of brave Black Men, Women and Children who challenged Slavery, Jim Crow, and Segregation. They didn’t wait for a charismatic leader to show them the way. Many of them ignited a fire on their own. Many of them used a larger movement to effect change in their own segregated corner of the world. They were women like Wells, Graham, Morgan, Smith, Browder, Colvin, McDonald, and Robinson. Footnotes, Scrapbooks, Family Albums, passed down orally. Never highlighted, never a part of the mass movement of freedom fighting. Elizabeth Jennings Graham was the first “documented” women to refuse to move on a streetcar in 1854 (that’s right 101 years before Rosa). She was late for church and was told to get off the car. Her crime was riding while Black. Graham had to be forcibly removed. Like Rosa, Graham was no stranger to the fight for desegregation of streetcars in New York. Her father was a well-known pastor and organizer in the community. This event gave them the chance to push Elizabeth’s case to the forefront with the goal of desegregating New York’s public transit system. With her father’s aid and the backing of the community, she pursued the case in court suing several entities including the street car company. In a landmark decision, the courts ruled in her favor and by 1861 the same year the Civil War began, NYC’s transit system was fully desegregated. Then came Ida B. Wells a more familiar name, yet upon utterance does not make one think of Boycotts and Trains. Yet (71 years before Rosa Parks) Ida refused to get up from her seat and move to a smoking car. She was forcibly removed as well. Ida would later file suit against the railroad company in protest of her ill treatment. She would win her case only to then have it overruled by a higher court. Like Graham, Ida was also a teacher and no stranger to speaking out. She was a leader in her own right and routinely organized men and women against racial injustices and gender politics. Graham, Wells, and Morgan all paved the way for the Fab Five Smith, Browder, Colvin, McDonald, and Robinson. 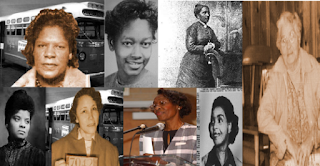 Then came Aurelia Shines Browder Coleman, and finally Mary Louise Smith in October 1955 (nearly 3 months before Rosa Parks) who all refused to move to the back of the bus. Susan “Sue” McDonald agreed to become a plaintiff in the Browder vs. Gayle case after she had also been, on numerous occasions, removed from transit after challenging segregation. All of these women were empowered and compelled to make a difference. Many of them galvanized, organized, and uplifted their communities. They were challenged and challenged others to make a difference. Whether through the initial deed or the following law suit, Graham, Wells, Morgan, Smith, Coleman, Colvin, McDonald, and Robinson made the conscious decision to organize their actions into the larger community struggle of desegregation. The "Fab Five" were clearly aware of and working within the frame work that had been organized years before the first refusal to move in Alabama made the news. In December of 1955 Jo Ann made good on those threats after a 42 year old fair complected woman refused to move to the back of the bus after working all day. Her name was Rosa Parks. Jo Ann broadened the scope of Rosa’s actions by creating and distributing (with her blessing) the paperwork that notified the Black community of the boycott. The wheels were set in motion and it was a concerted effort. The communal actions of many resulted in the desegregation of buses in Montgomery, Alabama in 1956. Six years later, The Interstate Commerce Commission ordered all forms of transportations desegregated. Of course, the price for these victories came with blood shed as Whites who begrudged the end of Jim Crow committed terroristic acts against Blacks including but not limited to the 16th Street Church bombing where four little angels lost their lives. So the truth about Rosa isn’t much different from what you’ve been taught in school. Your teacher just left out some important key facts. Rosa was not some stand-alone figure who just decided to stand up to racism. Rosa was an organizer. She was an integral part of the desegregation and anti-Jim Crow movement. It was community centered. Its essence was organic, but it took preparation. It’s important that we know this. It’s important we have a firm foundation of organization and of solidarity. It warmed my heart when I read about the Bus Boycott in Israel in 2011. Palestinian students, taking a note from Black Civil Rights and Desegregation movements tried to board a bus from the West Bank to East Jerusalem through routes reserved for non-Palestinians. I streamed the event live into my classroom. This was history in the making. The actions were a blimp on the wider world stage but it mattered to me. I got it. The Philadelphia Student Union also gets it. Students become galvanized to advocate for and try to effect change in issues pertaining to their education. Many of its tactics are directly correlated to the tactics and strategies used during the Civil Rights movement. Organization and an active community brings results. Wells, Graham, Morgan, Smith, Browder, Colvin, McDonald, and Robinson were a movement, and part of a movement. Footnotes in history, yes, but no less important than Rosa Parks and no more important than the nameless African Americans who did the same with no recognition. I’ve written their names over and over. I’ve put their names in bold. This is done for you to remember them. Yes remember and praise them but know that they were a part of a larger picture. A larger movement. It was not organic, it was deliberate, it took preparation, and most importantly it took organization. For more on these women, please visit the links below.